This is a story about Kalea and Noah—two siblings who are also best friends. Best, best friends. Kalea, 6, is the big sister—the sassy, funny, outgoing one who loves skateboarding, riding her bike and playing soccer. Noah, 4, is the mellow, happy, easygoing younger brother—a little more cautious, but always game for whatever adventure his sister is plotting. They’ve spent their young lives doing almost everything together. But lately, they’ve been doing something together that no one in a bazillion years could have predicted: battling cancer. And not just any cancer, either. It’s the same cancer. In the same location. At the same exact time. It was Memorial Day weekend 2018, and Kalea woke up in the morning—and promptly threw up. The rest of the day she was fine, but the next morning the same thing happened. By Wednesday, she was complaining that her head was hurting. The family’s pediatrician sent them to a neurologist, who scheduled an MRI. But the night before that scheduled MRI, Kalea’s headache was so bad, she was in tears. Her mom took her to an emergency room near their Torrance home, and the ER doctor ordered an MRI right there. When he came back with the results, the look on his face told the story. The MRI had revealed a mass in the back of Kalea’s brain. It turned out to be medulloblastoma, one of the most common malignant brain tumors in children. Kalea was admitted to a local pediatric hospital, and three days later underwent surgery to remove the 3.5-centimeter tumor. About a week later, while she was still in the hospital, Noah started complaining about headaches, too. Surely he was just mimicking his sister? But Noah’s gait was a little off, too; it looked like he was leaning a bit. 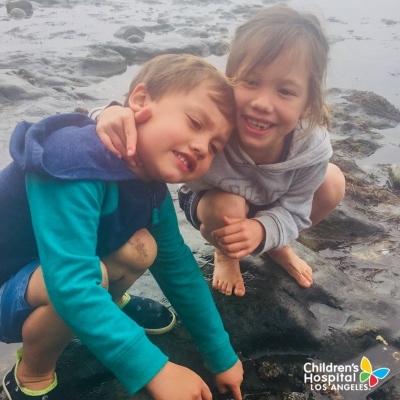 Parents Nohea and Duncan soon found themselves back in the ER, once again receiving stunning news: There was a mass in Noah’s brain, too—in the same spot as his sister’s. Duncan started crying. Nohea felt her whole body, her whole being, go numb. Both their kids had brain tumors? It was too much. Noah had surgery on June 25, exactly two weeks after Kalea. The parents steeled themselves for the battle ahead. Still, one thought gave them comfort. The first thing Nohea and Duncan did after Noah recovered from surgery was to transfer both children to Children’s Hospital Los Angeles. 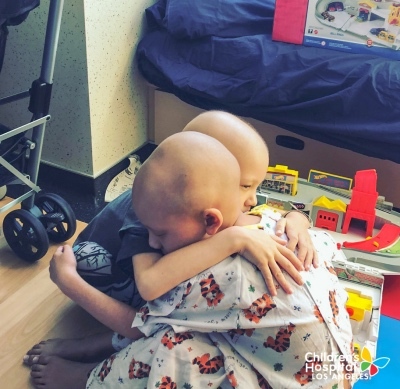 Once at CHLA, the siblings immediately started treatment. Although both had medulloblastoma tumors—which had not spread—and both had their tumors completely removed, their treatment paths differed. Kalea’s protocol began with radiation therapy, followed by a year of lower-dose “maintenance” chemotherapy. But because Noah is only 4, radiation to his brain was too risky. “The younger you are, the more that radiation to the brain can cause significant long-term side effects and impact a child’s development,” Dr. Dhall explains. Because Noah was undergoing intense chemo, he had to be hospitalized much more often for his treatment. Kalea, meanwhile, was usually an outpatient. 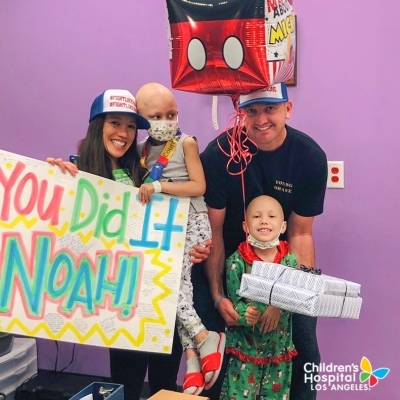 With CHLA’s support, the family arranged for the kids to often be together when Noah was in the hospital, and the pair became a regular fixture in his room or in the playroom. It helped both of them cope, but particularly Kalea, who understood more about what was going on. 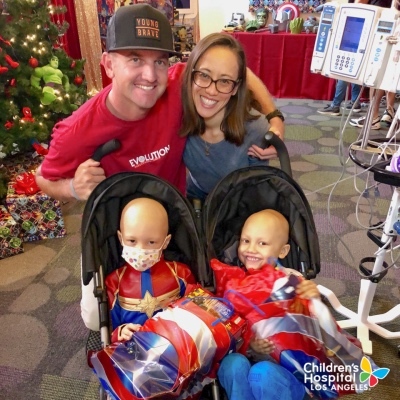 Another event that lifted their spirits took place in the fall, when Marvel Studios outfitted the family and their CHLA doctors and nurses in superhero outfits for a TV special. 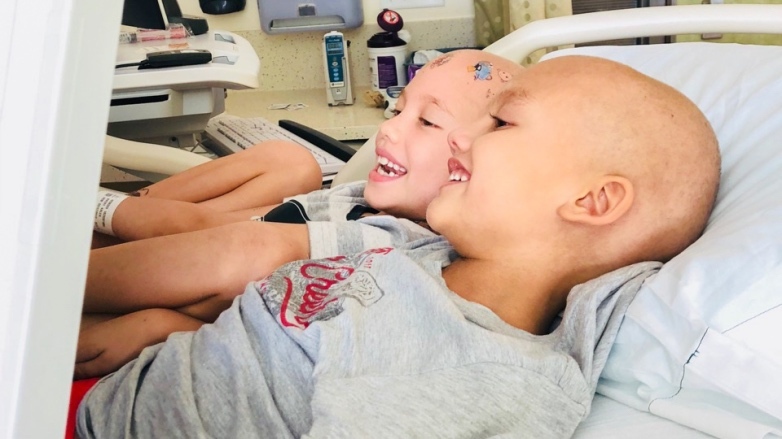 Noah and Kalea are big-time superhero fans, and they were outfitted as Spider-Man and Captain Marvel—a brother-sister cancer-fighting superhero duo. Of course, behind every kid superhero is usually a pair of superhero parents, and Dr. Dhall says this is definitely the case with Noah and Kalea. So how is it possible for two siblings to get the same tumor at the same time? That’s a question that the team at CHLA’s Center for Personalized Medicine is trying to answer. Both siblings and their parents have undergone genetic testing through the Center. An earlier test ruled out involvement from the typical genes associated with cancers, but the CHLA team went further—conducting something called whole-exome sequencing, which looks for abnormalities in genes that make the key proteins in a cell. That, too, came up negative. The team is now conducting more extensive testing, called whole-genome sequencing, on a research basis. Meanwhile, seven months into their dual cancer journey, Kalea and Noah are doing well. Noah completed treatment in early January, and Kalea is on track to finish this summer. “One down, one to go!” their mom says. Of course, no one is more eager for Kalea to finish than her best friend. When Noah received his end-of-treatment medal at CHLA, he proudly wore it all weekend. But he was already looking ahead to an even better moment. To help kids just like Kalea and Noah, please consider making a donation to Children's Hospital Los Angeles. Visit CHLA.org/Donate.